(1) How you do you think about evangelism? a. Is it the order of Christ? What was the Christ’s purpose of building the “Church Gk ekklesia”?Was that to increase believers by doing the evangelism? It used “the Great Commission” Therefore go and make disciples of all nations, baptizing them in the name of the Father and of the Son and of the Holy Spirit, (Matthew 28:19 NIV) as the flag. However, Christ never told to increase convert to Christianity. He just told to make disciples. The Western Church, for example, Francisco de Xavier of the Society of Jesus [1506-1552] of the Roman Catholic Church, and the evangelical Protestant organizations told the unbelievers about “salvation”, “eternal life” and “faith” from original sin. b. Christ never converted anyone. Christ himself never led people to convert. He did not ask the person in the Gerasenes who were possessed of evil spirits to convert, and he let the person to return to his home religion. (Mark 5:1-19) Christ said to the centurion “Truly I tell you, I have not found anyone in Israel with such great faith” (Matthew 8:5-13), and to the woman at Syria / Phoenicia “Woman, you have great faith!” (Matthew 15:21-28, Mark 7:24), even though they did not convert. c. Christ served for people. Rather he showed the example of “the Great Commandment” (Gk diakonia “to serve”, “to take care”, and “to wait on” based on “love your neighbor”). (Matthew 20:28, 25:44; Luke 12:37; John 12:2, 13:34). We should be aware of the gospel as if the “Kingdome (Matthew 24:14)” will come true in the future. It is a different gospel to sell drug of immortality until the age that the war, hunger, poverty, illness and death will vanish to come. (Galatians 1:8-9). As it is written “For the kingdom of God is not a matter of eating and drinking, but of righteousness, peace and joy in the Holy Spirit” (Romans 14:17) , the condition is filled with spiritual “righteousness, peace and joy” that are given by the God is the “Kingdom”. Therefore, the gospel is the “Kingdom” [“relationship between I and you”, the relationship that the God governs as the ruler of our heart] that was fulfilled in the first century. If it is, it is otherness to pray as “I hope I can go to your kingdom”. The prayer to set the God at your center of the heart as “your kingdom come” (Matthew 6:10) is the standard to be heard. (2) The Gospel is not the evangelism. a. The work of Christ was not the evangelism. By the cross of our Lord Jesus Christ (Galatians 6:14), light came into “the salvation of this world (salue undo)” from “the salvation from this world (salue emundo)”. Jesus himself was dispatched for suppressed sinners, weak and sick people. (für andere da sein). Christ’s ergon “work” is not the evangelism. (John 4:34, 5:36, 9:4, 10:25, 17:4) It was to serve the small people, who were suppressed, discriminated and ignored their human rights, first, last, and always. Matthew 20:28, 23:11, Mark 9:35, 10:43, 45, Luke 22:26, 2 Corinthians 4:5, 1 Timothy 5:16). b. What is a missionary work to tell people? Christians should not “evangelize” desperately to expand the teaching. Through its life, it is only necessary to show the treasure of Christ in the soil pot to people. “I have been crucified with Christ and I no longer live, but Christ lives in me. The life I now live in the body, I live by faith in the Son of God, who loved me and gave himself for me” (Galatians 2:20). In other words, it is good enough to tell “’Christ lives within me’. It is the Christian’s way to follow the example of Jesus, ‘Anyone who has seen me has seen the Father’” (John 14:9). (Ephesians 5:1, 2:10). You do not have to express yourself with the sacred robe, parent organization and knowledge of theological terminology, in order to be seen as a “Christian” label. Tracts, business cards and publications are unnecessary. The evaluation of the God and the public will be defined not by title, knowledge and talking, but by the way of life. Because we are the letter of Christ. “You yourselves are our letter, written on our hearts, known and read by everyone. You show that you are a letter from Christ, the result of our ministry, written not with ink but with the Spirit of the living God, not on tablets of stone but on tablets of human hearts” (II Corinthians 3:2-3). Therefore, missioning about Christ is nothing less than showing yourself who have changed by meeting with Jesus. It is not by just talking. *It is an example of people’s viewpoint, not just as a basis of the Biblical grounds. Shigeru Nakayama : Pastor Iwamura is actively working not only at Kobe, but also at Ishinomaki. I am looking for his report. Osamu Onodera : Yes. I think his work come from his policy or faith. I think it comes from his religious door. He is fantastic. He does not talk much about his religious thoughts. I think his life itself is the religion. Everytime, he visits here with different members by the wagon car for 10 people. There is Tetsuro Honda, who is taking care of worker’s haircut and living together with the people whose right of live is ignored, as an unpaid priest in Kamagasaki. 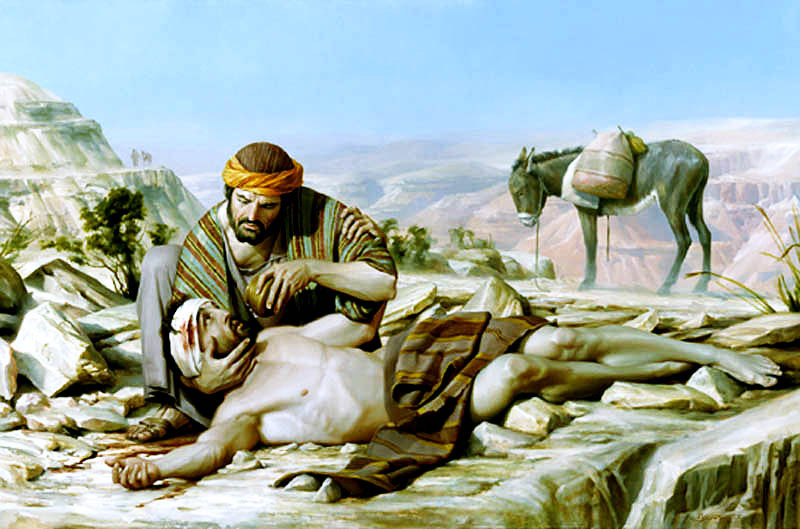 <Reference> He is cooperating with “one of the least of these” (Matthew 25:45). According to Honda, people who live at flophouse area or on the street never made effort to be the “one of the least of these”. They were made to be “small and least” by society, institution and enterprises. Even here, at the affected area, you do not need to do evangelism. “Sowing” that “Those who sow with tears will reap with songs of joy (Psalm 126:5)”, had been finished at the first century. (Mark 4:1-9, Matthew 13:1-9, Luke 8:1-15). The farmer, “a farmer to sow his seed”, that is Jesus Christ had been already sowed seeds in thorns, rocky places, and the wilderness. Because it is said “They are ripe for harvest (John 4:35)”, reaping is the work of missionary. Evangelism, such as forced conversion and intimidation that there is no salvation other than Christianity, are derailed from the teaching of the Bible. <Reference> Ecumenicity HP of Kobe International Christ Church. There is no biblical premise to propagandize. <Reference> HP of Kobe International Christ Church. Evangelism was carried as excuses for occupation of other ethnic groups, destruction of foreign cultures and enslavement of other ethnic groups, which had begun from Constantine the Great [Constantine I, AC.280 – 337] since the 4th century. ｃ.There is no Biblical premise to convert people. “No longer will they teach their neighbor, or say to one another, ‘Know the Lord’ because they will all know me, from the least of them to the greatest,” declares the Lord. For I will forgive their wickedness and will remember their sins no more” (Jeremiah 31:34). You do not have to evangelize “Know the Lord (Jehovah)”. The context of “The days are coming” ( , verse 33) means “the end of the period” that Jesus Christ is sent to the earth. “But in these last days he has spoken to us by his Son, whom he appointed heir of all things, and through whom also he made the universe (Hebrews 1:2)”. It means that we have entered “the era of the end” about 2000 years ago, since the birth of Jesus Christ. The publication of “sowing” is also an empty cleverness to find seekers. Aggressive evangelistic groups born from United States and South Korea are extreme biblical verbalism. People will be mind-controlled to believe the next verse blindly and credulously. There is no reading comprehension ability to enjoy the context while meditating it by alone. Paul preaches in the verse 20 as “for, Everyone who calls on the name of the Lord will be saved” (Romans 10:13). Even you do not call and seek name of the Lord and there is no one to teach, God says “I was found by those who did not seek me; I revealed myself to those who did not ask for me”. Once promulgated, you cannot make any excuse that you did not know about the traffic rule, and it becomes individual responsibilities. Because, the sowing had already been done by Christ, at Japan that is the East-end of the world, including China and the Korean Peninsula. “Planted” from “I planted the seed, Apollos watered it, but God has been making it grow (ⅠCorinthians 3:6)” is not a seed. It is just a seedling, a grafted tree or a cutting that grew from the seed. Paul only gave baptism to two people in his life. (ⅠCorinthians 1:14) Missionary activities, evangelism contests, evangelisms and missionary conferences are only for the purpose of increasing the number of believers and those are only self-satisfaction of the organizer side as well as publicity stunt or money wasting. Is there the place for Christ? Can you say that the gospel is ringing through the majestic synagogue, choir and event while making the authorities, academics and wealthy people to kneel down? The Gospel mission way of Christ himself. 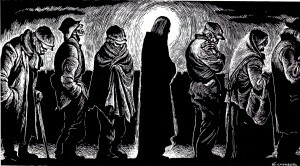 “Christ in the Breadline” Fritz Eichenberg [1901-1990]. Print. What is the manifestation of the gospel? The Bible is consistent. In Japan, Christ exists among suppressed “foreigners” like Koreans in Japan, “orphans, fatherless”, children whom lost their parents at the disaster, “widows” that lost their husbands, and discriminated people live in Buraku. To serve such “one of the least of these” is the Jesus’s gospel and work.